We have already seen all of the dire questions that an incoming student may need answered for three departments this year (School of Business, English Writing and English Education, and Biology & Chemistry). This week, we spotlight the majors for those bright pupils with creative eyes: the Department of Art. The art department offers four majors, including Studio Art, Interior Design, Graphic Design, and Art Education. Majoring in this department would certainly be for the more imaginative and expressive individuals, but for people like myself who lack innate artistic abilities, there are many courses you could take as electives. The past department spotlights have featured professors' answers to a set of questions. To personalize some of the answers a little more, this blog will feature a graduating senior's (Delaney Foskett) answers to the incoming art student's questions. What's your best piece of advice to an incoming art major? "My best piece of advice would be to look for inspiration everywhere you go. It’s all around you and can help you create the perfect piece or your next project. Also, never limit yourself to current trends or specific restrictions." What criteria is used to evaluate students in the art classes? The art department uses a 7 point scale and typically the largest percentage of your final grade come from projects. You will usually have lots of class time to work on them so there are plenty of opportunities for feedback and constructive critique, whether it be from your professor or your peers. Art can be pretty subjective and that can differ between each professor you have. Typically there will be in class discussions/critiques where you can explain your reasoning behind an idea. That helps you hone in on your vision and improve upon a previous design to make it even better in the future. To be an art major, does one have to already have a lot of creative ability? Explain why or why not. One would definitely have to have the creativity but I wouldn’t necessarily say you’d have to have the skills. Obviously talent is going take you a long way, but you will learn so much in your courses to build upon that. I’d say it would depend on your major in the end. 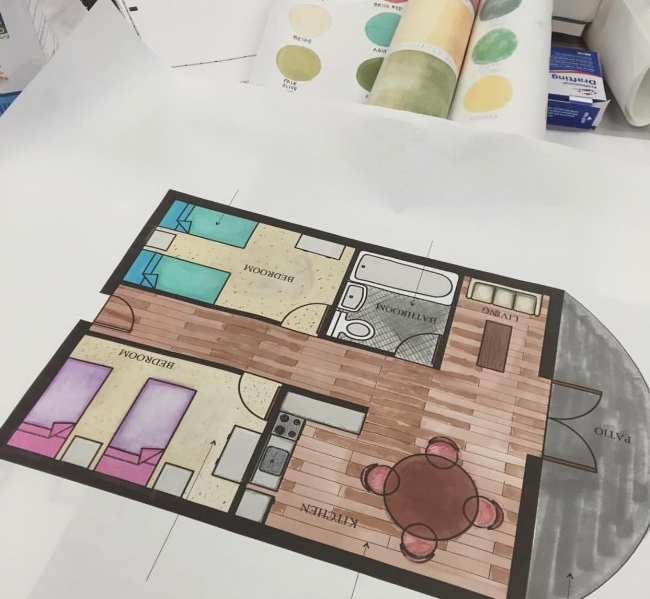 For me personally, I came in as an interior design major and I have a lot of skills for the hands on work but none of the software. Now, as a graphic design major, it’s the same situation. I have the visual creativity but I didn’t know how to use any of the software. Being embedded in the program, I’ve learned so much more than I could even imagine. I’d say being a studio art major would be the most difficult if you don’t have the basic skills of an artist. All that to say, anything is possible so don’t limit your experiences because you don’t think you’re good enough. What is the typical class like (lecture, hands-on, etc.)? It’s a good mix across the art department. Most of your studio classes (drawing, design, ceramics, etc.) are hands on, of course, but when learning more of the history (art history, aesthetics, history of architecture and interiors, etc.) you’re in a lecture type setting. 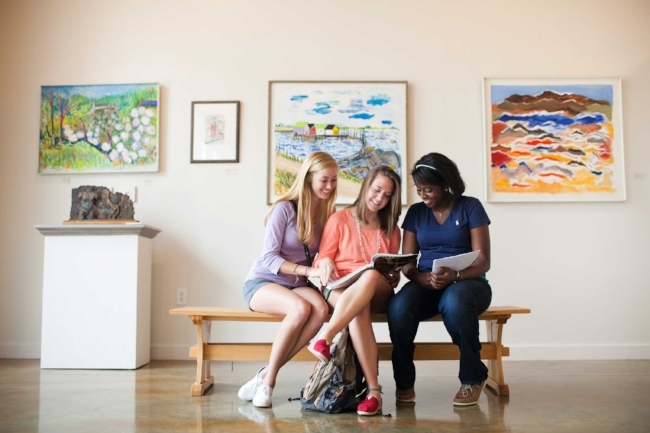 What distinguishes the MC Department of Art from other schools? MC is a small university which I think is so beneficial for the learning environment. You’re in small classes with, dare I say, intentional professors who get to know you, care about you and your success, and are so beyond helpful in your journey through college. Most of them teach multiples courses, so you grow as an artist under their guidance over the course of your time at Mississippi College. I wouldn’t be the artist I am today without Dr, Miley’s drawing class, Mrs. Berdami and Mrs. Baumann’s interior design genius, Mr. Cooks photography teachings, or Mr. Ivey and Mr. Mummert’s graphic design help. They have shaped who I am and what I see as an artist for the better. What kind of jobs can you expect with an art degree? The spectrum is so broad for an artist. You can go into the world and sell your work, you can be a teacher, a photographer, an interior designer, a decorator, an architect, a salesperson, a landscaper, graphic artist etc. the list could go on and on. I don’t think people realize how much art is in the world in various mediums. I know a Disney artist, a wedding photographer, a NCIDQ certified interior designer, a website designer, and a teacher. All who graduated from MC with various art degrees. What resources do students have to improve success (i.e. reaching out to professors, tutors, etc.)? You have close relationships with your professors with daily office hours, tutoring hours in the Mac Labs on campus, along with workrooms and supplies that help you create and design to your heart’s content. My favorite thing would have to be the sample room in the interior design building. Fabric samples, endless finishes, supplies, and so much more adorn the walls of that room. It’s amazing. As you may have gathered, the Department of Art fits right in with the culture of MC's high expectations for its students while also possessing the same willingness from instructors to help overall student success as in other departments. In my one art class at MC, I was challenged to use the creativity I had to improve my limited skills. In just a semester I had made drastic improvements in my work and learned techniques that I couldn't have even dreamed on my own. Needless to say, if you're an aspiring art major, imagine what you could do at MC with both the creativity and the skill! Looking for that perfect place to take that special person in your life? Read here for some ideas! Do you find yourself doing the same mundane activities when you're provided some free time? Read here to find out ways you can provide meaning to these spare moments. Spring sports at MC are just underway! Read for a preview of the upcoming Choctaw athletic seasons featuring Athletic Director Mike Jones. We love the message of God's forgiveness in the parable of the prodigal son, but there's another son that Jesus uses in his metaphor. Find out which son you are, and what perspective you need to become more like the Father. Sometimes you've been working really hard in the classroom and need a breath of fresh air. Other times you may just be looking for ways to hang out outside with your friends. Read this blog for some suggestions of ways you can maximize your fun on the MC campus. Reception season is almost here so mark your calendars! Read here for a little about the reception in your area. Each chaplain of each club or tribe has a different experience and mission for their organizations. This blog highlights those insights.